Tuesday evening, the Cowley College’s Earle N. Wright Community Room played host to over 140 individuals attending the Cowley College Foundations Annual Scholarship Reception. The event, in its fifth year, brings together scholarship recipients with the community members, donors and alumni who donate money to the foundation in support of scholarships. The reception has continued to be a success and is held each year thanks to a generous contribution from the Trust Company of Kansas, which has been the event sponsor from the first year. Over the course of the evening, the Foundation awarded 165 scholarships with a total value of over $105,000 for the 2015-2016 academic year. Attendees were welcomed by Cowley College’s new president Dr. Dennis Rittle and the Foundation board president Dr. Nick Rogers. Ben Schears, vice president for institutional advancement, Elizabeth Thummel, endowment coordinator, and Lisa Grose, scholarship coordinator, were on hand working to make the event a success. “The funds our donors provide to support the college can be a real game-changer in the lives of many of our students” vice president for institutional advancement Ben Schears said. After announcing the scholarship recipients, Schears made a special presentation to Cowley College sophomore Paige Lundin, who is involved in the Act One Drama Club, Cowley Concert Choir, CC Singers, and the visual arts program. She also works part-time at the Tiger Deli and is a member of the Dean’s Honor Roll. Lundin has accomplished all of this without the assistance of student loans. To recognize her hard work and dedication, Schears awarded Lundin with the Gertrude Newman Scholarship, while Great Western Dining provided Lundin with a meal card to use in the McAtee Dining Center during the 2015-16 academic year. 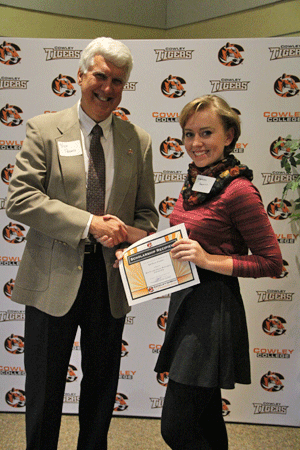 “Paige truly has embraced what it means to be a Cowley Tiger,” Schears said. “She has worked hard to avoid student loans while also being very involved in campus life and maintaining high academic standards – we recognized that and wanted to commend her for her efforts”. Kayla Wiggins, Tanner Balsters, Bethany Balzer, Jack Detrick, Amy Diver, Maggie Fink, Zachary Frederick, Joseph Haydon, Hollie May, Jonathan Ryberg, Colter Silhan, Erika Van Boening, Mary Wellman, Hannah Wilson.